FGO debut this season. 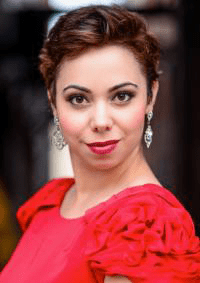 She has been a member of numerous young artist programs including the Merola Opera Program, Pensacola Opera, Kentucky Opera, Des Moines Metro Opera, and Opera Theatre of Saint Louis. Recent roles include Eunice in André Previn’s A Streetcar Named Desire with the Merola Opera Program, Angelina in Rossini’s La Cenerentola, Carmen in Bizet’s La tragédie de Carmen, Olga in Lehár’s Die lustige Witwe, and Maddalena in Verdi’s Rigoletto with Shreveport Opera; and Dorabella in Mozart’s Così fan tutte with Pensacola Opera. She is also the recipient of an encouragement award from the Metropolitan Opera National Council Auditions. Eliza earned her bachelor’s degree from Shorter College and her master’s degree from Florida State University. This season at FGO, she sings Berta in Rossini’s The Barber of Seville and Krystina in Weinberg’s The Passenger, and study-covers Rosina in Barber and Lisa in The Passenger.